This is the perfect hospitality promotion to start your customer’s day off right. Who doesn’t want a little coffee or drink before they start their day? 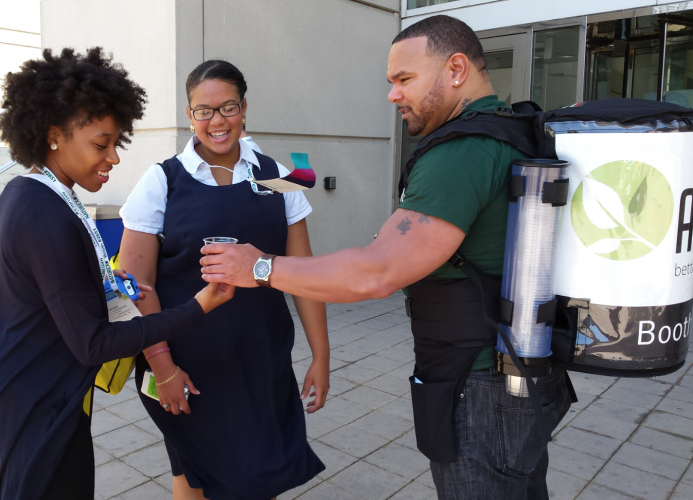 Brand ambassadors, wearing mobile Rocket Pack backpacks, will greet attendees as they arrive at your event and offer a hot cup of coffee or cold beverage, complete with branded branded cups. Walking Billboards - Bold advertising is placed on serving backpacks, along with uniformed staff, will get your brand noticed. Sponsor Education - Brand Ambassadors can be scripted or handout promotional post cards, enhancing the promotion.